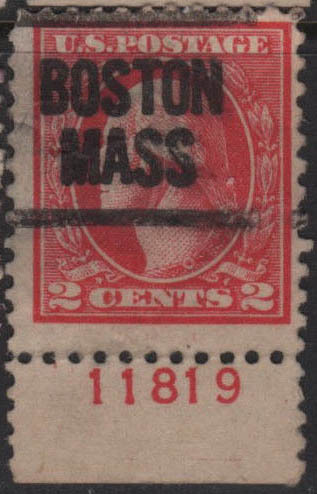 For unknown reasons, the plate number was manually entered for this plate. 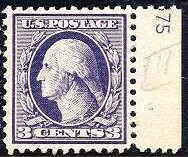 If you have additional information on this topic, please contact the Webmaster using the link at the bottom of this page. 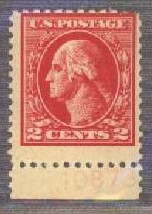 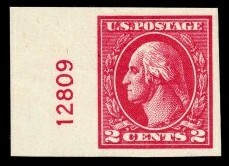 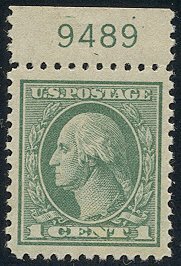 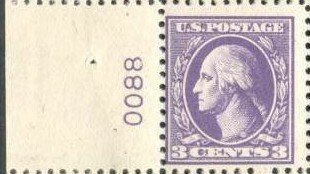 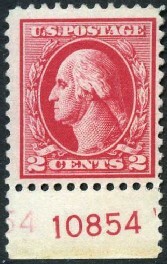 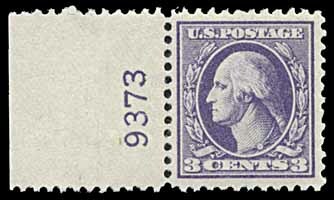 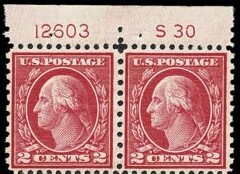 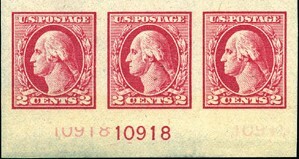 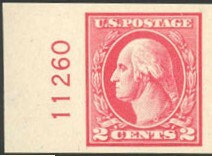 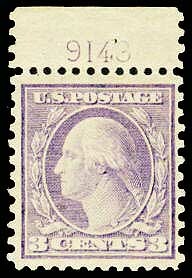 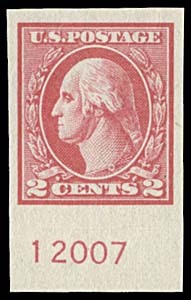 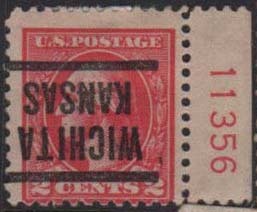 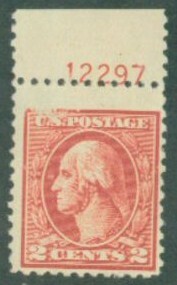 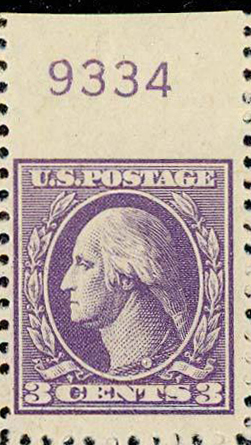 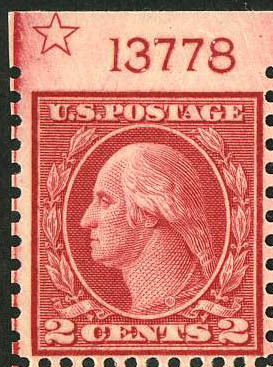 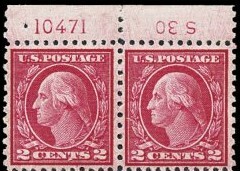 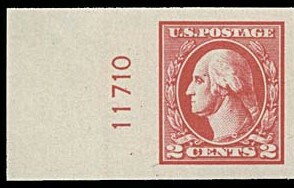 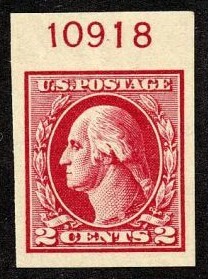 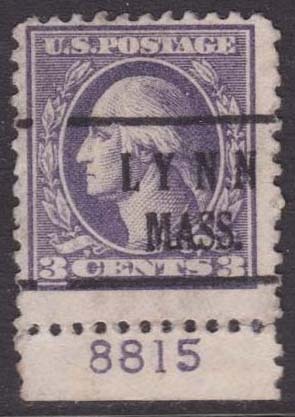 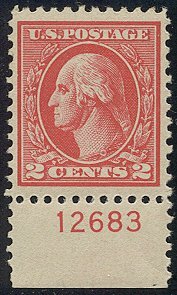 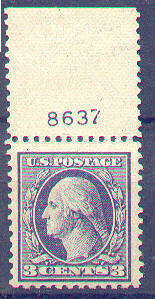 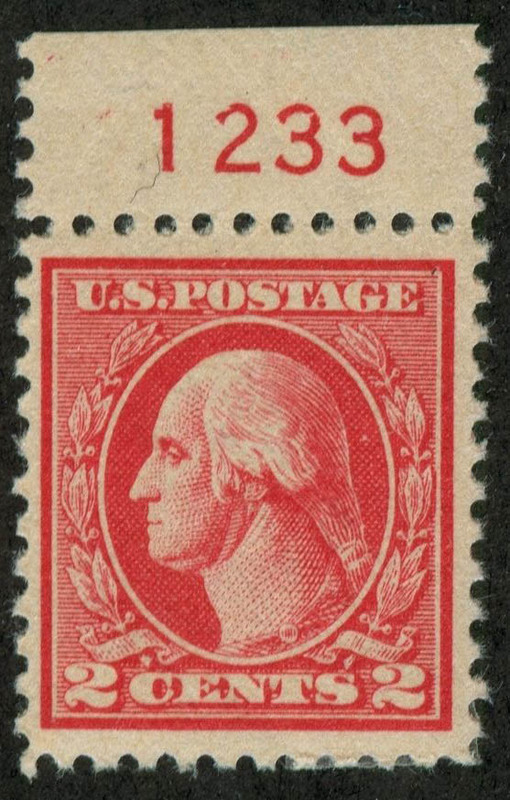 Beginning with plate 11329 in May 1920, initials began to reappear on Washington-Franklin issues. 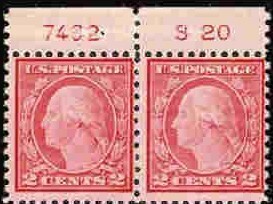 Initials had previously appeared only on flat plat printings, but Otto A. Myers (OAM) inscribed his initials directly above the left top plate number of several offset plates. 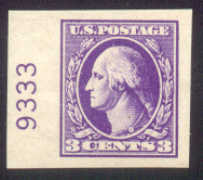 Through July 1920, various printers' initials were intermittently inscribed on 30 or more different plates that were used to produce Scott 528 and 528A (perforated) and 534 (imperforate). 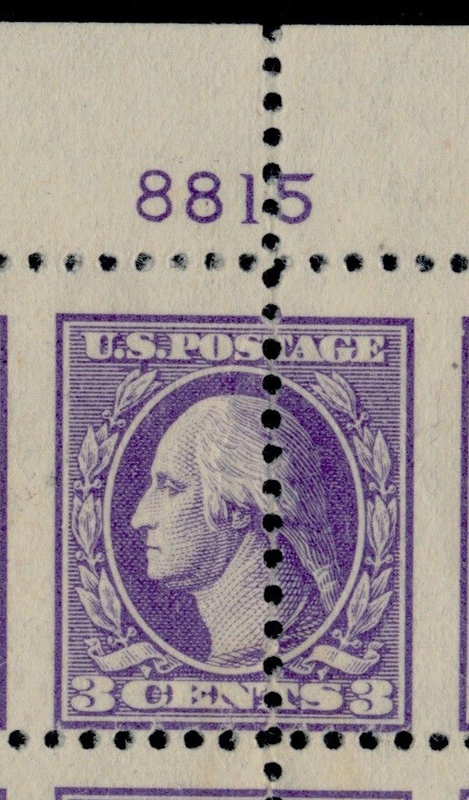 For some reason, for plate 8375, the plate numbers were not placed in their traditional positions in the selvage. 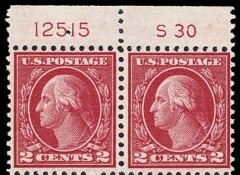 Bottom pair shows the plate number straddling two stamps, right single shows only part of "375". 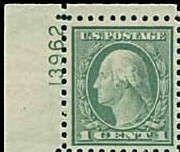 Scott 530, 3¢ Type IV, used, plate number 9383, with perfin "R I"
All other Left plate numbers have the bottom of the plate number toward the image. 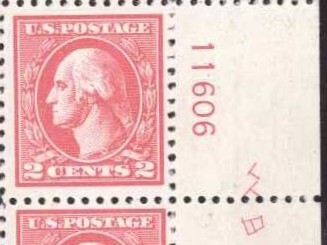 This variety apparently occurs only on left plate blocks of plate number 8800 -- or should that be "0088"...? 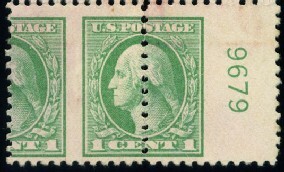 Portions of sheets that had already been perforated 10 vertically for use in coils, were later perforated 11 horizontally so that what had been formerly scrap could then be sold for regular sheet postage. 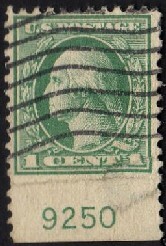 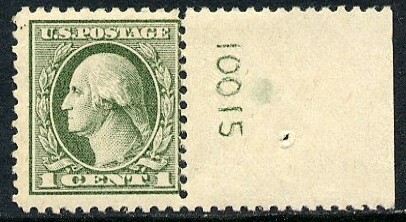 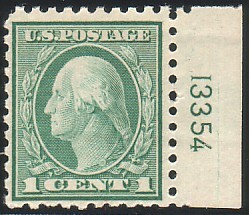 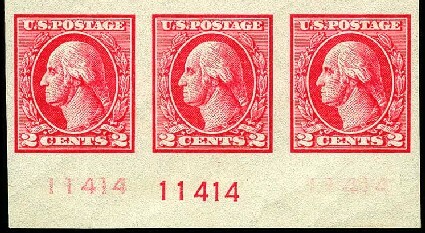 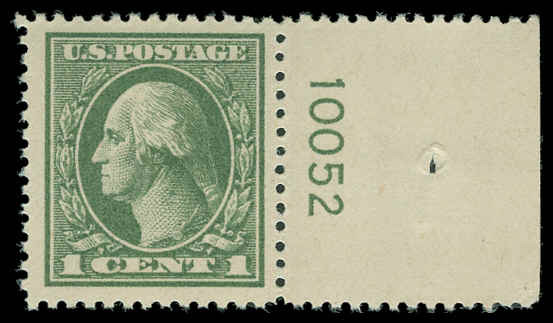 Of 271 plates used to print Scott 540, 10471 is the only number with the inverted S30. This page last updated December 17, 2018.